Before my diabetes diagnosis, my body was starving. I still had a little insulin production, so my body was getting some nourishment, but not enough, leaving me constantly hungry and thirsty. So I ate. I ate everything without gaining weight. It was a vain glutton’s paradise. After my diagnosis, I was immediately put on insulin, which meant that my body was finally utilizing all of those calories I was eating. I was told that I would gain weight if I continued eating the same way, so I tried to cut back a little on my calorie intake. I would no longer inhale a whole box of ice cream every night, but I did continue to overeat, and it quickly started to show. I never became obese, but I did pack on over 25 lbs. VERY quickly, and ended up the heaviest I have ever been. To say that I was not comfortable at that weight is an understatement. My clothes didn’t fit, I looked different, moving around became uncomfortable, and I was very unhappy. I worked as a preschool teacher the year after my diagnosis, and all the teachers had their photos taken and hung by the entrance to the school so that all the parents knew who we were. I remember that Polaroid photo all too well. I hated it back then. So I made a decision to change. I bought a gym membership and I made some major changes to my diet. Going to the gym and being active wasn’t new to me. I played basketball before high school, had taken aerobics classes, and occasionally popped into the weightlifting area. And I do have the good quality that I don’t care about what people think of me in the gym. I go there and do my thing and assume that others do the same. 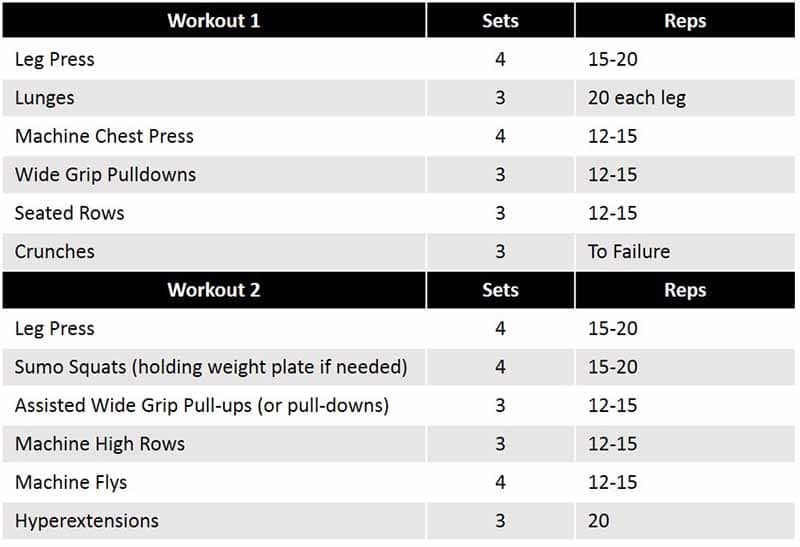 As part of my membership, one of the trainers made me a workout schedule and I got started. If memory serves me right, he wrote up a program consisting of three full body workouts per week. Cardio wasn’t described in details, but he told me to do 40-60 min, 3-4 days per week. I wasn’t told to push myself with the weights but was shown how to use the machines correctly (no free weights), so I wouldn’t hurt myself. Then I was sent on my way. It wasn’t a bad program, but if I had known better back then, I would have accepted his plan as a good starting point, and then created a new program after the first 4-6 weeks, where I would include free weights and start to push myself a little harder. 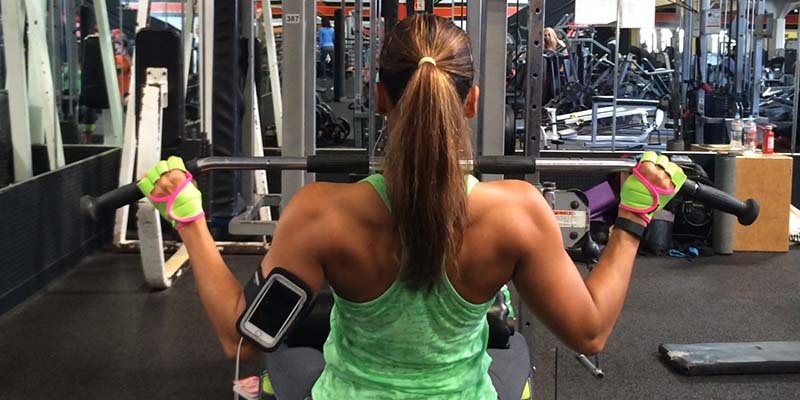 The reason why I always suggest that beginners stick with machines, relatively high reps (12-15), and lower weight for the first 4-6 weeks, is that the body needs to get used to working out with weights. The ligaments and tendons need to be strengthened and most of all we want to limit the risk of injuries. So why change it up after 4-6 weeks? Well, that’s about the time it takes for your body to get used to a workout. And why increase the weight and push a little harder? Because you get a better return on your investment. My diet was more of a challenge. In hindsight, I definitely ate way too little, but I also saw results, so I kept pushing down that path. Most days I would eat no more than 1200 calories, way too little for my 5’8 (173 cm) frame. I had read somewhere that cottage cheese was good for weight loss, so I mainly ate cottage cheese with veggies and fiber crackers. And I lost weight. Today I know that cottage cheese is great due to its high content of slowly digested protein, and that’s what makes it great for weight loss. I also know that significantly under eating will make you lose fat, but also cut into valuable muscle mass, slowing your metabolism and making it even harder to keep the weight off long term. I learned this the hard way, by seeing my weight yo-yo over the years, mainly due to diets like this. The key learning here (and it took me a LONG time to learn) is to always fuel your body correctly. By just eating very little, you might get quick results, but the weight will most likely come back quickly (plus some). A better solution is to calculate your daily calorie equilibrium (you can learn how here) and subtract 500 calorie/day. The science behind this is that a pound of fat is approximately 3,500 calories, and a healthy fat loss is no more than 1 pound a week for a typical adult. 3,500 calories divided by 7 (the days in a week) equals 500 calories/day. How you get those calories are also important. 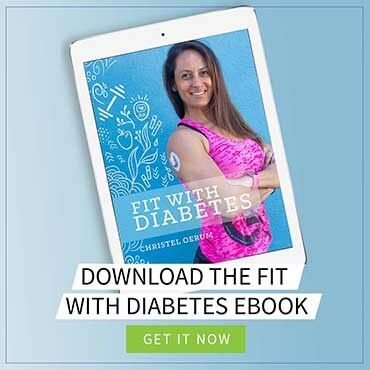 Whether you are a person with diabetes or not, you need carbohydrates, protein, and fat. Yes, fat and carbs! Don’t ever follow a diet where you cut out carbs or fat completely. Both have a purpose, such as feeding your brain and muscles, ensuring your body’s transport and absorption of vitamins, etc. Try to have protein, carbs and fat in reasonable portions at every meal. The only thing I did correctly from the start was managing my diabetes. 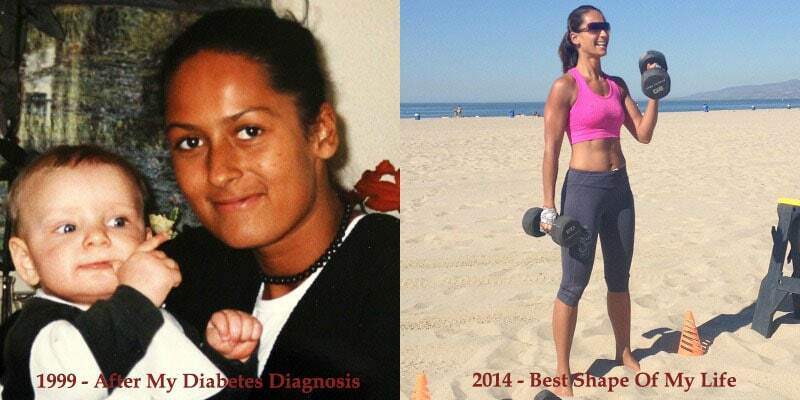 I never stopped taking my insulin or under-dosed to lose weight. I put in the work in the gym and kitchen instead of looking for easy but unhealthy shortcuts. The worst thing you can do is managing your weight by letting your sugars be too high. It may give you a short-term weight loss, but it will hurt you badly in the long run. Your health is much more important than losing weight as quickly as possible. Focus on getting your diet on track and educate yourself about proper nutrition. Lift weights. Building a little muscle will make both losing weight and managing your blood sugar a lot easier. Cardio is not everything! Enjoy life, and remember that eating too little will hurt you in the long run. Eat clean and healthy rather than starve yourself! 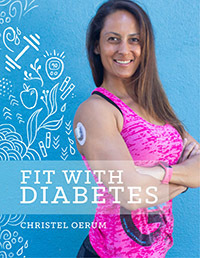 (If you need help with a workout and meal plan, I offer online personal training and diabetes coaching). Going to the gym and being active wasn’t new to me. I played basketball before high school, had taken aerobics classes, and occasionally popped into the weightlifting area. And I do have the good quality that I don’t care about what people think of me in the gym. I go there and do my thing, and assume others do the same. Thank you for sharing your story with us. Both my younger siblings are type1. I am going to share this blog post with them. my boyfriend is a type 1 as well and he went through this exact same thing. He was extremely thin the first few years of his diagnosis, but once he was put on insulin, he ended up gaining like 30 ish pounds due to being on the Omnipod. After getting off it and going back to pens, he lost the weight pretty easily. Thanks for posting this. I was diagnosed with Type 2 and I’m trying to lose weight. I’ve gained weight since the diagnosis, and it’s been discouraging. I recently started a few classes at the gym. However, I am seriously considering meeting with a trainer to help me mix things up. I appreciate your tips. Keep up the good work. If you are looking for a trainer, Christel and I both offer online personal training. We will create a custom workout and meal plan for you and work with you over Messenger/Skype to keep you on track. Thank you for this! My dad has diabetes and could use these tips! I can use them to hopefully avoid diabetes since it runs on both sides of my family!